The S-1110P-XT Industrial Temperature PoE Media Converters address the need for transparently connecting 10/100/1000 Ethernet equipment that operate in extreme temperatures to fiber while providing Power over Ethernet ( PoE ) to standards-based PoE and PoE+ compliant devices. 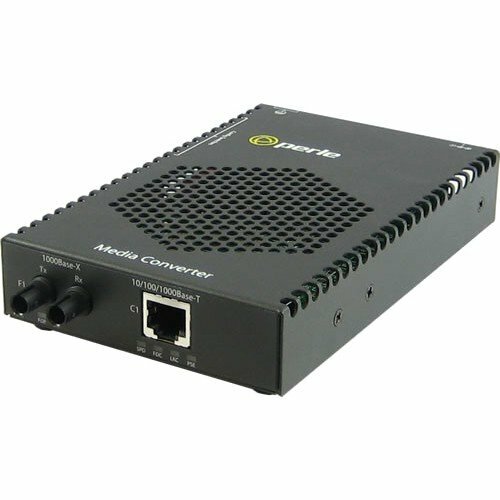 The S-1110P-XT PoE Media Converters will operate in industrial grade temperatures of -40F to +167F (-40C to +75C). Equipment found in traffic management, oil and gas pipelines, weather tracking, industrial and outdoor applications must function in temperatures that cannot be supported by a commercial based media converter. Boasting this extended temperature feature along with a rugged steel casing, the S-1110P-XT Media Converter provides an economical path to extend the distance between two industrial devices subjected to harsh environments and severe temperatures such as security cameras, wireless access points, alarms, traffic controllers, sensors and tracking devices. If you have any questions about this product by Perle, contact us by completing and submitting the form below. If you are looking for a specif part number, please include it with your message.